The bloody history of a myth. When studying the past, it is tempting to explore what men and women aspired to: what sorts of societies they envisioned, and what sorts of measures they undertook to make them real. This is a hopeful approach, but often the wrong one. As Thomas Hobbes pointed out long ago, and as current events affirm once again, fear is often a more effective motivator than idealism. The more important questions, therefore, can be the more dismal ones: What are people’s fears? And what crimes are they willing to countenance in their name? Paul Hanebrink’s magisterial new book, A Specter Haunting Europe: The Myth of Judeo-Bolshevism, applies this insight to the history of 20th-century Europe. Not long ago, studies of that ill-starred time and place tended toward cautious optimism. They often focused on the rise and fall of the communist dream. That story of utopian hopes and bloody realities, confined to the past by the end of the Cold War, was well suited to a new Europe that styled itself as a beacon of freedom and human rights. Hanebrink’s book offers us a history more appropriate for our moment. It asks what the story of modern Europe looks like if we take the racist fearmongering of the present as our end point, rather than the heady proclamations of justice and dignity streaming from Brussels. Hanebrink’s strategy is to shift our attention away from the specter of communism and toward its rival, anticommunism. This will seem like an odd choice only if we think that anticommunism was a banal and content-free politics defined by what it opposed. On the contrary, anticommunism was itself a significant ideology, animating a vast array of social, political, and military experiments across the globe that sought to justify aggressive warfare, racialized policing, and, occasionally, even social reform. In a dialectic that even Marx could not foresee, it became just as powerful as the specter of communism it was designed to confront. How is this to be explained? How did anticommunism garner such mass and elite appeal? The traditional answer would be that communism is a flawed and violent system, rendering large-scale resistance to it that’s easy to explain. But Hanebrink makes a different argument. By showing how anticommunism was tightly entwined with questions of race and nationalism, he explains how it ended up conjoined with another politics of fear that was remaking Europe in the early 20th century: anti-Semitism. This explosive combination came to be known as “Judeo-Bolshevism”: the idea that there was something “Jewish” about communism, and thus that individual Jews were dangerous because they were committed to violent revolution. The linkage of long-marginalized Jewish communities with the genuinely powerful communist movement was, while mythical, astonishingly successful—and astonishingly lethal. The myth of Judeo-Bolshevism helps account, in Hanebrink’s view, for the ferocity of anticommunism in 20th-century Europe. And yet, for all its influence and power, the history of this myth has not yet been told. Hanebrink’s geographically capacious and heroically researched book gives us this story in all of its horror. He follows the myth of Judeo-Bolshevism from the Russian Revolution to the present, ferreting out its origins and surprising transformations in both Eastern and Western Europe, and sometimes across the Atlantic, too. This fresh vantage on a familiar time and place leads us to crucial new questions that we still face today. We are buffeted with reminders of the mass graves filled by communism. But what if racialized anticommunism filled even more? What lessons, then, would the 20th century provide to our fear-drenched present? Communism has long been linked with Jews, largely because of some of its prominent early theorists, including Karl Marx, were Jewish. But while it is true that many communists have been Jews, and vice versa, the linkage is more mythical than empirical. Most communists, to state the obvious, were not Jews, just as many Jews, even leftist ones, were not communists. While it is true that communism offered something important to racial minorities like Jews, they were far from the only ones to believe that capitalism had overstayed its welcome and that the unprecedented success of the Russian Revolution provided a model to emulate. Myths, though, tend to be more compelling than facts, and from the Russian Revolution onward the Judeo-Bolshevism canard achieved mainstream acceptance. In Western Europe and the United States, diplomats and journalists, concerned about the potentially revolutionary proletariat on the home front, believed that Bolshevism was something suspiciously Jewish, foreign, and anti-national. Winston Churchill, Thomas Mann, and Robert Lansing, the US secretary of state under Woodrow Wilson, all gave voice to this paranoia. The chief Russian correspondent for The Times of London—and therefore a chief conduit through which the British learned about the revolution—was also convinced of the myth’s veracity. In a 1919 dispatch sent back to England, he claimed that a “seething mass of Jewish pauperdom” had reached for the works of a “German Jew” to topple the noble Romanov dynasty. He went even further in a book, in which he invoked a blood libel: These Jewish paupers, he opined, had then killed the royal family in a ritual murder. The myth found even more fertile ground in Eastern Europe, where larger Jewish populations coincided with more plausible fears of Soviet military incursion. In the wake of World War I, as the land empires of the East gave way to a hodgepodge of squabbling nation-states, incipient nationalism combined with geopolitical and racialized paranoia to authorize violence against local Jewish populations. Wilson and the other negotiators at the Versailles peace conference turned a blind eye to the ongoing pogroms against “Jewish Bolsheviks.” However horrible, these pogroms were, to Wilson and the other Versailles attendees, less terrible than the butchery they imagined would transpire if the Bolsheviks came to power in the East. The idea of Judeo-Bolshevism had greatest resonance in Germany, where the National Socialists defined themselves by their overwhelming hatred of Jews and communists alike. The myth, Hanebrink asserts, “made Adolf Hitler,” who convinced just enough Germans that a cabal of Jewish communists was responsible for Germany’s humiliation during World War I, and that only the National Socialists could confront them. Once in power, Hitler used the myth of Judeo-Bolshevism to justify the aggressive policing of political dissidents and Jews at home. But after dispatching the homegrown communist threat, Hitler remade the myth by turning it outward, insisting that only aggressive military action could rid the earth of the Jewish Bolshevik. This simple message coursed through the Nazis’ omnipresent propaganda apparatus. The Institute for Scientific Research on the Soviet Union, for example, published reams of pseudoscientific work on the Jewish nature of Soviet rule. Its experts explained to audiences foreign and domestic that Jewish Bolsheviks could not be reformed, that they were creating a society of untold cruelty and barbarism on the fringes of Europe, and that without aggressive action, the dangers they posed would eventually engulf the entire continent. This imagined threat was used to justify Hitler’s invasion of the Soviet Union and, fatefully, the massacre of the enormous Jewish population of Eastern Europe. While in practice the SS murdered Jews of every political hue, Hanebrink shows that its blackshirted killers often understood their barbaric work as cleansing “Jewish Communists” from the region. This program helped Hitler find allies, too. Unlike many other aspects of Nazi ideology, Judeo-Bolshevism had already developed deep roots in Europe, from Paris to Pinsk, and the brutal occupation policies of the Red Army did much to give it new life. One of the central facts of modern European history is that anti-Semitic violence was often taking place before Hitler’s armies arrived. The Holocaust, like the Judeo-Bolshevik myth that helped to inspire it, was a European phenomenon. Much of this will come as no surprise to many readers, even if Hanebrink adds a larger, synthesizing sweep to this terrible history and a host of new details to our understanding of Europe in the years between the Russian Revolution and World War II. The more novel and provocative elements of his argument come in the book’s second half, where he argues that the myth of Judeo-Bolshevism helped inspire thinkers and movements on both sides of the Cold War. By doing so, Hanebrink offers us a crucial insight into postwar political formations. It is often imagined that postwar Europe, at least in the West, had learned the lessons of the global conflagration and embarked on a new course in support of tolerance and human rights. That story is not wrong, but it is incomplete. In the shadows of postwar prosperity, the myth of Judeo-Bolshevism continued to lurk in the racialized forms of anticommunism that persisted throughout the Atlantic world. The myth also took a strange turn in Eastern Europe from the late 1940s onward, as communists began to deploy it against one another. In the Soviet Union, anti-Semitic propaganda reappeared as Stalin rounded up Soviet Jewish doctors he suspected of conspiring against him. In Czechoslovakia, a series of show trials targeting Jewish communists took place in 1952. Beyond these well-known events, Hanebrink also unearths a trove of anti-Semitic documents from across Eastern Europe that came from communist governments and that were directed at their Jewish citizens. The revived racism that swept through communist Europe might seem like a simple and cynical manipulation of residual anti-Semitism, designed to shore up the flagging popularity of the region’s ruling communist parties. It may have been that, but it was also a fateful reprisal of specifically Judeo-Bolshevik themes. As Polish, East German, Hungarian, Romanian, and Czechoslovakian communists labored to cultivate an image as sturdy sons of the nation, they distinguished themselves from the rootless “Jewish” Bolsheviks, who needed to be purged in the name of socialist and national renewal. In Poland, to take just one example, Władysław Gomułka insisted that the party had too many Jewish leaders and that this was keeping it from achieving mass acceptance. His assertions led to ominous threats against many of the Polish Jews who had survived the Holocaust, and who were now publicly disparaged as disloyal “Zionists” and the wrong kind of Bolsheviks. In Western Europe and the United States, anti-Semitism of this official sort was taboo. That didn’t mean, however, that the myth of Judeo-Bolshevism simply withered on the vine. It flourished, Hanebrink argues, in new form: Dropping the explicit anti-Semitic content of the myth, this racialized form of anticommunism now turned against those “Asiatic” expressions of communism at war with the West. This was a new myth, to be sure. But it still conjured a connection between communism and the racial other, and it still used the resulting myth to justify appalling violence around the world (most notably in Vietnam). While Cold War anticommunism had multiple origins, Judeo-Bolshevism was perhaps the most important, especially in Europe. Sometimes, the linkages were explicit. Eberhard Taubert, for instance, was a high-ranking member of Joseph Goebbels’s Ministry of Propaganda who spent much of the 1930s disseminating textbook Judeo-Bolshevism in Germany. After the war, he shed the overtly anti-Semitic elements of his thought and founded an anticommunist organization, partially funded by the CIA, that attempted to educate Germans yet again about the supposed foreignness and barbarism of communism in their midst. Both sides of the Cold War, therefore, created images of fear and subversion with roots in the myth of Judeo-Bolshevism, and which targeted cosmopolitan and borderless troublemakers. In both East and West, the image was redrawn for a new time, but Hanebrink makes a compelling case that it was too deeply entrenched in political ideology and culture to disappear entirely. In Hanebrink’s telling, it is racial panic, rather than misguided utopianism, that defined Europe’s 20th century. The end of the Cold War marked a turning point, but not a rupture. Even after communism was largely banished from the continent, the Judeo-Bolshevik myth found dark corners in which to grow. As European intellectuals and politicians struggled to interpret the communist experience, the linkage between communist crimes and Judaism emerged once again. In the West, this was largely an academic affair, if an especially heated and regrettable one. In Germany, for instance, historians revived the idea that Hitler had, as one of them put it, a “rational” reason to fear the Jews: namely, the Jewish devotion to Bolshevism, and therefore to the destruction of Germany. In Eastern Europe, though, it was a matter of life and death. The necessary reckoning with the communist past could often become racist, as the small populations of surviving Jews found themselves blamed once again for the crimes of their countries’ communist governments. The worst purveyors of Judeo-Bolshevism, such as Romanian dictator (and Hitler ally) Ion Antonescu, were rehabilitated by a new generation of nationalists. 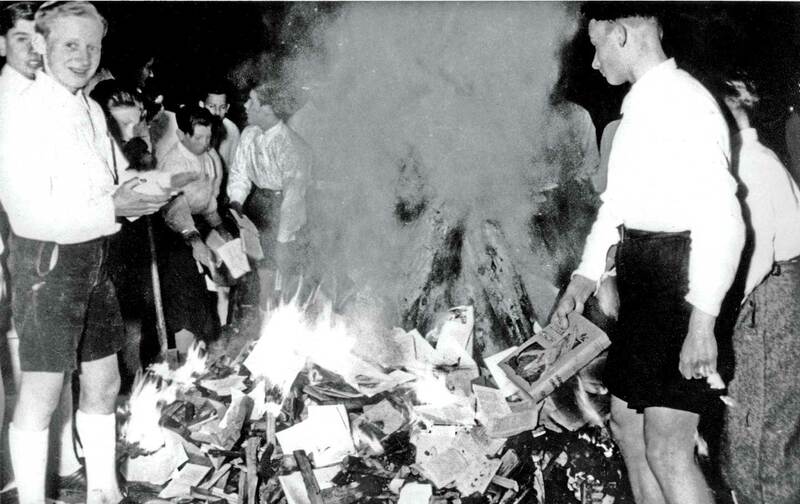 Meanwhile, in some places it became legally dangerous to publish clear truths about the Holocaust. (In Poland, for instance, a law was recently passed that makes it illegal to claim complicity between Poles and the crimes of the Third Reich.) So just as the myth finds new forms, its murderous legacy is being swept under the rug. Hanebrink’s book covers this dark history with insight and skill. He has the linguistic ability to bring Eastern Europe fully into the narrative, and the vision to include American and Western European debates, too. The end result is a major intervention into our understanding of 20th-century Europe and the lessons we ought to take away from its history. One of the shibboleths of the standard historical narrative about the 20th century is that it saw a long contest between various utopian and murderous visions, giving way at last to postideological democracies and the triumph of human rights. Given the current fractures on the European continent, this narrative is no longer plausible. The neo-fascist parties of contemporary Europe are just as deeply rooted in the continent’s history as their liberal opponents, if not more so. Hanebrink’s stated purpose is to unveil the myth of Judeo-Bolshevism, but he ends up casting doubt on the myth of Europe, too. Despite its significant achievements, Hanebrink’s history leaves some important questions unanswered. For example, he neglects to provide a robust analytical corollary to his stunning collection of evidence. Why, exactly, did this particular image of the Jewish Bolshevik prove so compelling and lethal in the first half of the 20th century? And to whom, exactly, did the myth appeal? (Hanebrink provides enough evidence to discount the easy answers: Communists, liberals, and nationalists all contributed to its popularity and are complicit in the violence it engendered.) Did it spread equally in different classes, and among men and women alike? Also, did 20th-century nationalism necessarily presuppose Judeo-Bolshevism as its other, or did healthier forms of nationalism exist as well? If so, what distinguished the two? The lack of analysis along these lines clouds some of the connections that Hanebrink seeks to draw between the past and the present. At the end of his book, Hanebrink argues that the contemporary suspicion of Muslim immigration should be viewed as yet another transformation of the Judeo-Bolshevik myth. The Muslim, too, is viewed as an Eastern invader who brings a dangerous ideology with him. There is a structural similarity, to be sure, but this is only to say that racism is endemic to European history—which is tantamount to saying that the pope is Catholic. Likewise, while anti-Semitism is on the rise in Europe and elsewhere, it seems unlikely that this owes much to the Judeo-Bolshevik myth as such. George Soros, to take one prominent example, is vilified as a liberal nationalist, and sometimes even as a recovering Nazi, but not as a Judeo-Bolshevik in Hanebrink’s sense. The ideological categories of the past are now being scrambled as those of the Cold War become less and less relevant. We are faced with different specters, not just those of the 19th and 20th centuries. This is not to say that we are no longer conditioned by the past. Rather, it is to point out that the genealogy connecting our century with the one preceding it will be more global than Hanebrink’s Eurocentric version, and it will traverse the former maritime empires of Western Europe in Africa and Asia as much as their great landed counterparts in Eastern and Central Europe. While it is true that we are once again living through a leftist resurgence and a capitalist crisis, nearly everything else has changed. The Judeo-Bolshevik myth made sense so long as global politics were oriented around the Russian Revolution and its aftershocks. That era has, at last, come to a close. A Specter Haunting Europe provides us, therefore, less with an analysis of our present than with a warning from the past. Misguided fear, not misguided optimism, led to the greatest disasters of the 20th century. Persistent racism was amplified by global political upheaval, leading to genocidal violence. And however much the particulars may have changed, this could happen again. Hanebrink’s book is a reminder of how challenging it will be, in an era of uncertainty and chaos, to sustain the only politics that can sustain us: a politics of hope. James ChappelJames Chappel is the Hunt Family Assistant Professor of History at Duke and the author of Catholic Modern: The Challenge of Totalitarianism and the Remaking of the Church.